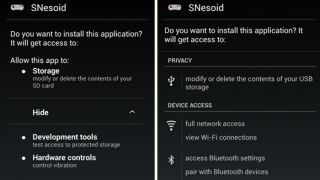 Google Android 4.2 is set to launch with the LG Nexus 4 and Samsung Nexus 10 on Nov. 13, and it'll be packing at least one previously undetailed feature: a new security system. Google's expanded malware scanner will build on top of the already-existing Google Play app scanner by checking third-party apps, too. This includes software downloaded from the Amazon Appstore as well as sideloaded apps. Google promises that malware scanning on a device running the enhanced Jelly Bean OS will happen instantly and always take place in the background. "The server does all the hard work," Lockheimer told Computerworld. "The device sends only a signature of the APK so that the server can identify it rapidly." This means that safe programs will be installed uninterrupted. It's only when an app raises red flags or matches malicious software that users will see an alert. Lockheimer assured Android users that Google is always scanning APK software on the Internet beyond its 700,000 applications in the Google Play store. "We have a pretty good understanding of the app ecosystem now, whether something's in the Play Store or not." Google's new security system will roll out alongside a host of other Android 4.2 features that the company has promised. This includes a double notification bar, new Photo Sphere functionality, and multiple user accounts for Android-powered tablets. Google was expected to show off all of these Android 4.2 capabilities, including the new security system, this week. However, Hurricane Sandy forced the company to cancel its Oct. 29 event in New York City.